The Legend of Hell House is a British film directed by John Hough (The Watcher in the Woods) and written by Richard Matheson, based on his novel. The movie features a talented cast including Pamela Franklin (The Innocents), Roddy McDowall (Fright Night), Clive Revill (Bunny Lake is Missing) and Gayle Hunnicutt (Eye of the Cat). A team of paranormal investigators is hired by a dying millionaire to investigate the notorious Belasco House and gather evidence of the existence of life after death. The house is reported to be one of the most haunted places on earth—a place where people experience violent deaths or are driven mad. This paranormal investigation takes on chilling consequences for the team, as the supernatural events escalate in intensity and their lives become at risk from the demonic forces. The filmmaker creates a suitably eerie and foreboding atmosphere while weaving a suspenseful tale that is highlighted by strong performances from the actors. 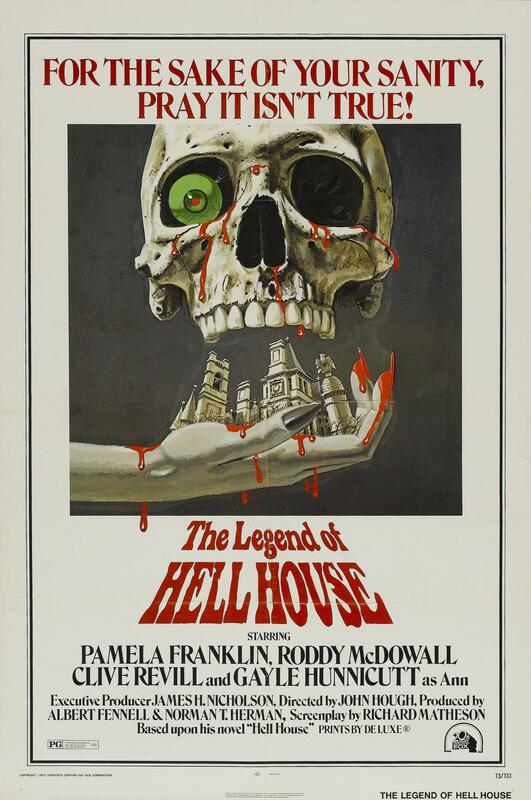 The Legend of Hell House was nominated for a Golden Scroll Award for best horror film of 1973 along side other great scary movies (Don’t Look Now, Sisters, Theatre of Blood) with the award going to The Exorcist that year. Based on the bestselling novel by Jay Anson, The Amityville Horror is an American film directed by Stuart Rosenberg (Cool Hand Luke) and featuring James Brolin (Capricorn One), Margot Kidder (Superman) and Rod Steiger (In the Heat of the Night). The book and movie claim to be based on the real life experiences of the Lutz family who experienced frightening, paranormal events after moving into an older house with a violent history on Long Island, New York. In the film version, the father seems to fall under the control of the malevolent spirits in the house. The movie is a well-executed supernatural thriller, as the director effectively builds the suspense and terror. The paranormal happenings are largely creepy and threatening, and the cast delivers convincing performances. 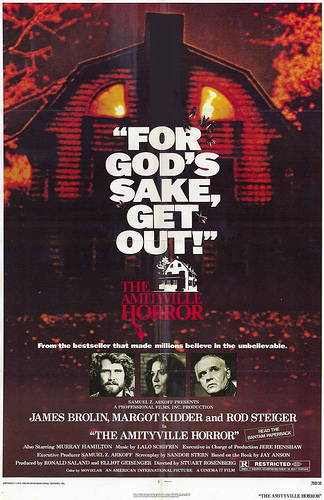 The Amityville Horror received largely negative reviews from the critics when it was first released, but was a big success at the box office, bringing in more that 86 million. The movie’s score was nominated for an Academy Award and Golden Globe. The Amityville Horror was also nominated for Saturn Awards for Best Horror Film and Best Actress (Kidder). Don’t bother with the 2005 remake featuring Ryan Reynolds. 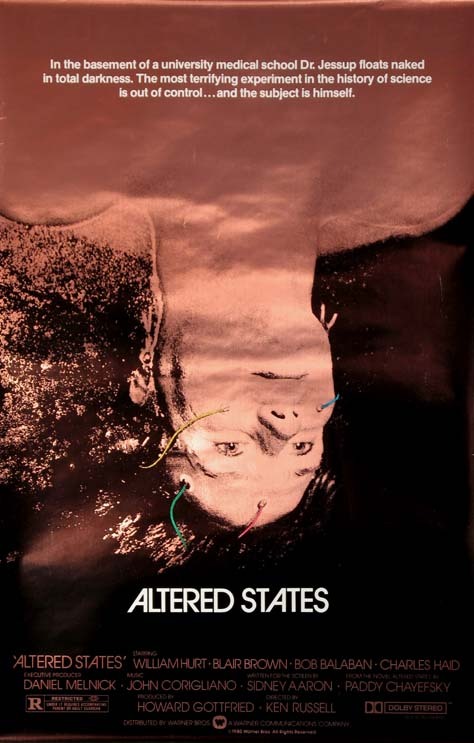 Based on the novel and adapted for the screen by renowned screenwriter Paddy Chayefsky (Network), Altered States is directed by Ken Russell (The Devils). The movie was notable as it marks the film debuts of both William Hurt (Kiss of the Spider Woman) and a young Drew Barrymore (E.T. the Extra-Terrestrial). A scientist experiments on himself with mind altering drugs and sensory deprivation while in an isolation tank. As a result, he begins to experience disturbing physical and mental changes, as his body undergoes an evolutionary regression to a primitive-like monster. Ken Russell has created a flamboyantly, extravagant fright-fest with stellar performances from his cast. It is a film that is both weird and wonderful in typical Ken Russell fashion. The film was nominated for two Academy Awards—for Best Sound and Best Original Score. Altered States was also nominated for three Saturn Awards for Best Science Fiction Film, Best Director and Best Writing. Based on the novel by Gaston Leroux, The Phantom of the Opera is a silent film classic directed by Rupert Julian (The Cat Creeps) and featuring silent horror film legend Lon Chaney (The Hunchback of Notre Dame). A hideously deformed former composer lurks in the shadows of the Paris Opera House committing many atrocities including murder in an attempt to win the love of a young songstress and make her his star. 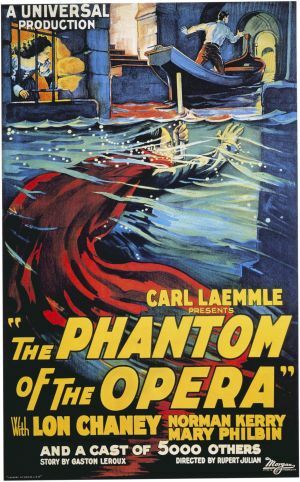 An impressive melodramatic tale of terror, The Phantom of the Opera is considered a work of art today due to its highly stylized film imagery and Chaney’s fine performance. Lon Chaney worked laboriously on his own make-up for the role, which was kept a secret by the studio until the film’s opening. Universal released remakes of The Phantom of the Opera in 1943 and 1962. The musical version based on Andrew Lloyd Webber’s stage hit was released in 2004. The Phantom of the Opera is rated #52 on Bravo’s 100 Scariest Movie Moments. 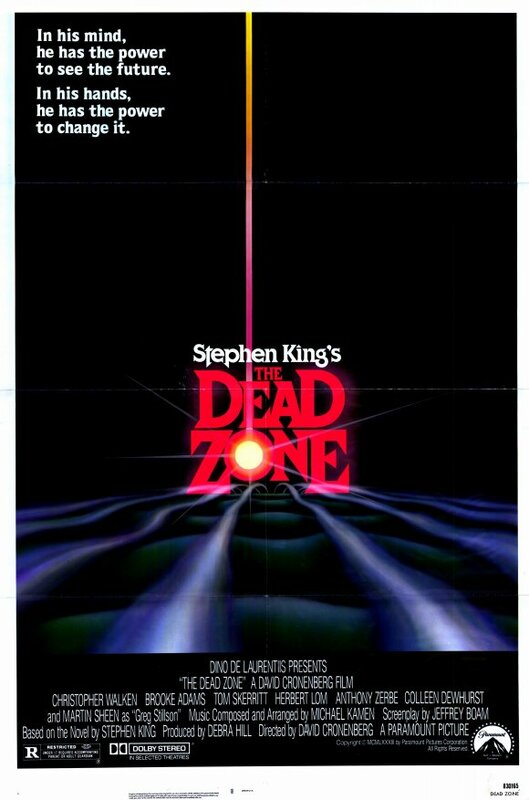 Directed by Canadian filmmaker David Cronenberg, The Dead Zone is thriller based on novel by Stephen King and featuring a strong cast including, Christopher Walken (The Prophecy), Martin Sheen (The Believers), Tom Skerritt (Alien) and Brooke Adams (Invasion of the Body Snatchers). After being injured in a car accident, a local schoolteacher ends up in hospital in a coma. Five years later, he awakens from the coma and tries to resume his life only to discover he has acquired psychic abilities. Walken’s character now has visions of past and future events triggered by touching items or people. The film is a subtle and effectively unsettling supernatural thriller featuring interesting characters and strong performances, in particular from Christopher Walken. The film received favorable reviews and won the Saturn award for best horror film of 1983. The Dead Zone was also adapted into a critically acclaimed television series featuring Anthony Michael Hall that ran for six seasons on the USA network. Posted on October 19, 2012, in Horror, Movies and tagged Altered States, Amityville Horror, Blair Brown, Brooke Adams, Christopher Walken, Clive Revill, David Cronenberg, Dead Zone, Drew Barrymore, Gaston Leroux, Gayle Hunnicutt, Horror Films, horror movies, James Brolin, Jay Anson, John Hough, Ken Russell, Legend of Hell House, Lon Chaney, Margot Kidder, Martin Sheen, Paddy Chayefsky, Pamela Franklin, Phantom of the Opera, Roddy McDowall, Rupert Julian, scary films, Scary Movies, silent film, silent movie, Stephen King, Stuart Rosenberg, The Dead Zone, The Legend of Hell House, The Phantom of the Opera, Tom Skerritt., William Hurt. Bookmark the permalink. Leave a comment.